A full night’s sleep is essential to your overall health. If you are well rested, you will feel good and be able to function at your best. 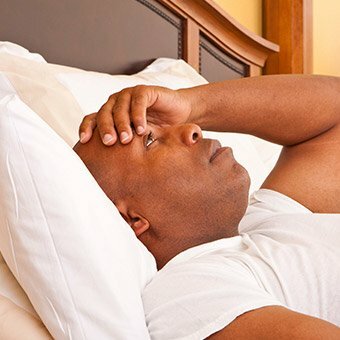 According to statistics, approximately 25 million adults in the United States suffer from obstructive sleep apnea (OSA), and more than three times that number snore! At Powell Dental Sleep Solutions, we provide care to address these issues so that you can enjoy a safe and uninterrupted night’s sleep. Why Choose Powell Dental Sleep Solutions for Snoring & Sleep Apnea Treatment? When a person has sleep apnea, they experience repeated pauses in breathing while asleep. This causes the body to go into “panic mode” and partially wake up to restore breathing, preventing someone from getting the deep, restful sleep they need to feel energized throughout the day. This is most often caused by the soft tissues in the mouth and throat relaxing into and blocking the airway, which is called obstructive sleep apnea (OSA). These kinds of blockages can occur up to 100 times per hour, and in many cases, patients wake up completely unaware that they have occurred (though some wake up gasping or out of breath). How Does Snoring Develop into Sleep Apnea? The sound of snoring is produced from the upper airway of your throat and caused by loose and relaxed vibrating tissues during breathing. The sound may come from the soft palate and uvula, the back of the throat and tongue, or a combination. It is an indication that air is having difficulty passing through the airway. 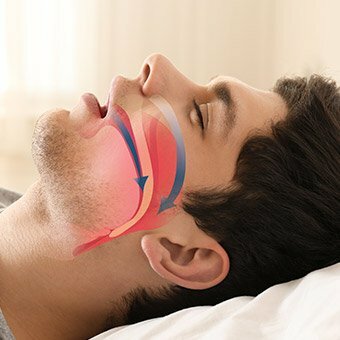 It may also be a sign that the person has an upper airway resistance or constriction, indicating a serious health condition called obstructive sleep apnea (OSA). About 50% of snorers have OSA. It is possible that some persons may have OSA and not snore. Snoring is considered a precursor to Upper Airway Resistance Syndrome (UARS) and can often progress into Obstructive Sleep Apnea (OSA). Most of the time, it’s a bed partner or family member that first notices the stoppages in breathing typically associated with sleep apnea. When a patient goes to see a doctor about this problem, they will recommend that they undergo a sleep study to determine the root cause of the issue. This will involve the patient sleeping while wearing a medical device to monitor their vital signs. After the study has concluded (which only involves one night of sleep), the results will be evaluated by a sleep doctor, who can then determine whether or not a patient has sleep apnea. This acronym represents a summarized measurement for types of breathing obstructions that meet certain criteria. The ‘A’ represents ‘apnea,’ which means without breath or oxygen delivery for 10 seconds or longer. The ‘H’ represents ‘hypopnea,’ which refers to abnormally slow or shallow breathing for 10 seconds or longer and a drop-in oxygenation by 4% or greater. The ‘I’ indicates an ‘index’ that can be thought of like an overnight hourly average. It is calculated by adding the total number of apneas plus hypopneas and dividing that number by the total amount of hours slept to obtain the AHI. 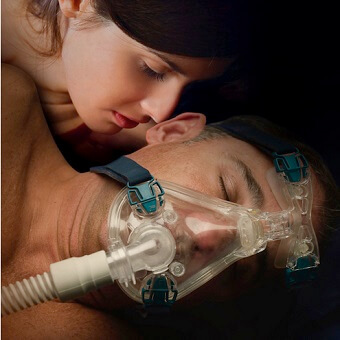 “RERA’s” are sleep disordered breathing events that do not qualify as an apnea or hypopnea. They can fragment sleep and can cause poor sleep quality and inflammation, however, they are not counted within the AHI calculation. They may be calculated in a separate respiratory index report. An AHI between 0-4.9 events/hour is classified as normal, although these persons may have respiratory disturbance events that cause symptoms seen in OSA. 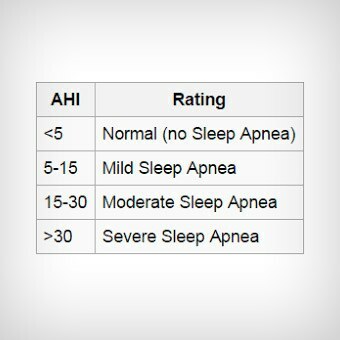 Mild sleep apnea is an AHI of 5.0 to 14.9 events/hour, moderate is greater than or equal to 15 but less than 30 events/hour, and severe sleep apnea is greater than or equal to 30 events per hour. Subtle breathing irregularities may briefly block the airway and cause your sleep to be interrupted. These respiratory events are included with the apnea and hypopnea events in the RDI (respiratory index) measurement, therefore the RDI may be higher than the AHI. For a healthy person, a normal blood-oxygen saturation is between 96-99% at sea level. At night, our respiratory effort decreases, and oxygenation will dip lower than when awake. While small reductions are normal, those with sleep apnea can experience a drop in oxygenation that has many negative health effects. Reduction to not less than 90% is considered mild. However, dips into the 80-89% range are considered moderate, and those below 80% are severe. When the body is deprived of oxygen, the heart rate and blood pressure increases, placing stress on the heart from activation of the nervous system. Chemicals are released into the blood that cause inflammation and promote elevations in blood sugar. This inflammation can damage the heart, kidneys, brain, and blood vessels, increasing the risk of heart disease, stroke, and obesity. A sleep study can reveal the levels of oxygenation during your sleep. Additionally, it can give us clues as to how sleep deprivation and fragmentation may adversely affect your brain health, memory consolidation, and overall feelings of vitality. The three types are obstructive, central and mixed sleep apnea. Obstructive sleep apnea occurs when the airway becomes repeatedly blocked. Central sleep apnea occurs when the respiratory center in the brainstem does not activate properly to alert the patient to breathe. Mixed sleep apnea is a combination of obstructive and central. 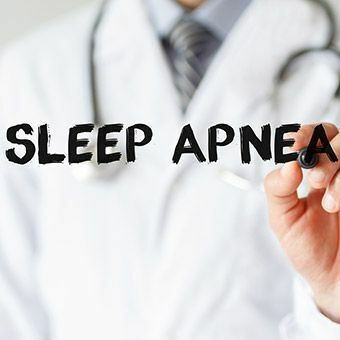 Different types of apneas require specific types of treatments, and your sleep physician can determine which one you have based on a sleep study. As we touched on above, there are various types of sleep apnea, and the specific type or combination of types determines the treatment options available to a patient. The most common and gold standard treatment for OSA is positive airway pressure treatment (PAP), which may be referred to as CPAP, Bi-PAP or Auto-PAP. They all work by delivering pressurized air through a nasal or face mask to keep the airway open throughout the night. In cases of mild or moderate obstructive sleep apnea, an oral appliance can be designed to advance the lower jaw and keep the tongue and soft tissues in the back of the throat from collapsing, thereby enabling the airway to remain open while sleeping. These appliances are easy to wear, easy to care for, and are comfortable as well as portable. 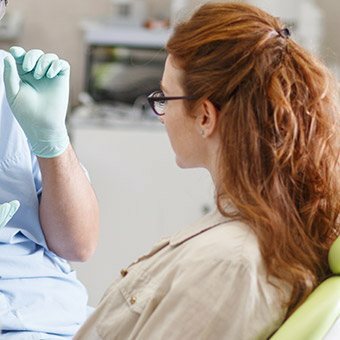 In cases where a patient is PAP intolerant, an oral appliance can serve as a viable alternative. In 2015, the American Academy of Sleep Medicine (AASM) and the American Academy of Dental Sleep Medicine (AADSM) updated treatment guidelines and recommendations for oral appliance therapy versus CPAP therapy. In summary, they said that either oral appliance therapy (OAT), CPAP therapy, or InspireUAS therapy can be considered as appropriate first-line treatments for upper airway resistance or mild to moderate obstructive sleep apnea and snoring. This suggests that either may be offered as an effective therapy based on a patient’s preference, although PAP therapy is still recognized as the gold standard. Oral appliance therapy should be considered as an appropriate first line option for patients with mild to moderate obstructive sleep apnea and snoring, or if a patient refuses, is intolerant, or finds CPAP therapy ineffective, even if severe. And, if neither of these options are effective, corrective surgery is another available treatment. This is normally used only if a patient has a physical obstruction in their airway, such as a deviated septum or a large set of tonsils, adenoids, or a bigger than average uvula.